William Lawrence Stribling, Jr., known as “Young” Stribling, was born in a small southern Georgia town in 1904. The son of a store clerk and a farmer’s daughter, he should have lived out his years in that rural setting, but he was performing in vaudeville before his fourth birthday and was a professional prizefighter by the age of sixteen. His rise through the boxing ranks and classifications was meteoric and he soon earned himself a place among the top fighters in the world. Stribling married his high school sweetheart and the couple had three children. Over the course of his career, Young Stribling traveled the world, rubbing shoulders with celebrities, sports legends, even royalty. Jack Dempsey counted him a close friend and Al Capone wanted to buy his contract and manage his career. Stribling was also a championship basketball player, an accomplished golfer, an exceptional tennis player, a pilot, and a speedboat racer. He even attracted the attention of Hollywood and was approached to star in a movie about himself. But he was always happiest at home in Macon, Georgia, with his family and friends. Young Stribling’s boxing career spanned twelve years. During that time he fought 287 matches, winning 224 and losing only 12. The rest were draws or “no decision” fights. Although he never achieved the championship title he sought, Young Stribling was true to himself and the values with which he had been raised. The most important things in his world were sportsmanship, honor, and doing his best. He never did less. Many years ago I had the opportunity to read a biography about “Young” Stribling written by an author named Jimmy Jones titled ‘King of the Canebrakes.’ All I can remember about that book now is that when I began reading it I thought that Stribling was a fascinating subject and the book was very good in the beginning. Unfortunately, the second half of the book lost some steam in my opinion and ended up being a bit of a letdown. But, I never forgot what I learned about Stribling so when I heard that there was a new biography out about him I was anxious to read it. The title of the new book is ‘The Greatest Champion That Never Was: The Life of W.L. “Young” Stribling’ and Jaclyn White has done a wonderful job writing the story of the life and career of this fighter from Macon, Georgia. The book is published by Macon University Press and is a 262 hardcover with dust jacket and loads of great photographs. According to Jaclyn, the bulk of the research was done by a long-time employee of Mercer University in Macon, Georgia by the name of Dr. James Bryant. Bryant wrote several books for Mercer University Press in the mid-1990s. He became interested in Stribling’s story and spent the next ten years compiling information with the intention of writing a biography about him. But, before he could complete the task, Bryant passed away suddenly in Not wanting to see her husband’s hard work go to waste, his widow, Marion, and the Stribling family asked the publisher to recommend a number of authors who might be willing to handle the job and they obviously chose the right person in Jaclyn. It’s not often that I come across a boxing book that I enjoy enough to knock off over the course of a couple days but I had a hard time putting this one down. When William Lawrence Stribling was born on December 26, 1904 his father rushed out and had birth announcements printed that introduced the infant as the future heavyweight champion of the world. If the boy’s father didn’t possess the qualities needed to become a world champion himself he was bound and determined to see that his boy became one. He and his wife developed a vaudeville act that included acrobatics and comedy and over the course of the next few years added their two sons to the act. W.L.’s brother Herbert was just a little over a year younger than himself. By the time the boys were seven and five year olds they were sparring with one another as a part of the family act. When W.L. reached the age of ten, the family was touring the United States and W.L.’s father was offering a $10 prize to any boy in his son’s weight class who could last three rounds of boxing with him. Not many could. Shortly after his 17th birthday, W.L. made his professional debut on January 17, 1921. Ultimately, he fought a total of 25 times during the year, losing only once. Over the course of the next 12 1/2 years Stribling would go on to fight almost 300 professional fights under his fathers management. The appendix in the back of the book credits him with a total of 287 fights including 224 wins, 12 losses, 14 draws, 36 no-decisions and 2 no-contests. When he was a couple of months shy of his 19th birthday and still in high school, Stribling fought for Mike McTigue’s light-heavyweight title before a largely partisan in Columbus, Georgia on October 4, 1923. Upon the fights conclusion, the referee initially ruled the bout a draw. But, when the threatening crowd voiced its displeasure, he consulted the newspapermen at ringside and awarded the contest to Stribling. Then, once he was back in the safety of his hotel, the referee reversed his decision again and declared the fight a draw, saying he had only declared Stribling the winner because he feared for his safety. So, McTigue retained the title. Regardless, it was an impressive performance by the youngster. Alas, Stribling never did win the world title his father predicted for him. While he would go on to defeat McTigue in a newspaper decision in 1924 and future lightheavyweight champion Tommy Loughran on two separate occasions, he lost to Berlanbach in June of 1926 with the light heavyweight title at stake and also lost to Jack Sharkey in a heavyweight title elimination bout in 1929. He went on to fight his way into a match for the N.B.A. heavyweight title against Max Schmeling in July of 1931 but suffered a 15th round technical knockout in The Ring Magazine fight of the year. It turned out to be his last opportunity to fight for a world title. But, Stribling was a very interesting character and was involved in many interesting pursuits outside of boxing. An all around athlete who excelled in basketball and acrobatics himself, he loved to golf, ride motorcycles and became an accomplished aviator who owned a number of his own planes and opened his own flight school. The story about him flying across the Pennsylvania border and performing a series of aerial acrobatics over Max Schmeling’s training camp and then hollering at him while making a low pass over the ring with the engine shut off a few short days before their fight is classic. Stribling loved playing practical jokes and going fast whether it was on a motorcycle, boat or plane and he was greatly admired by friends and foes alike for his good nature and love of life. In fact, Stribling reminds me a lot of Billy Miske. Though neither man won a world championship, they were both game courageous fighters who defeated world champions during their careers. And, like Miske, Stribling died before his 30th birthday and left a wife and three young children. Stribling passed away in 1933 as a result of injuries he suffered from a tragic traffic accident while riding his motorcycle to the hospital to visit his wife and newborn son. Who knows, had he lived maybe he would have managed to capture that elusive world title. After all, he defeated the reigning world light-heavyweight champion, Maxie Rosenbloom, in a non-title fight slightly more than a week before his death. I thoroughly enjoyed this book and can’t recommend it enough. The Greatest Champion That Never Was: The Life of W.L. 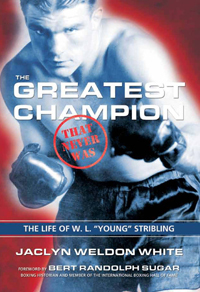 "Young" Stribling is the life story of a dedicated and talented boxer with integrity. William Lawrence Stribling, Jr., popularly known as "Young" Stribling, was born in a small Georgia town in 1904 to ordinary, working-class parents, and became a professional prizefighter at sixteen. His incredible rise through the ranks in his chosen sport led him to travel the world, attracting the attention of celebrities, royalty, and even gangsters - at one point Al Capone wanted to buy his contract and manage his career! During his twelve years in the ring, Stribling fought 287 matches, won 224 of them, and lost only 12 (the rest were draws or "no decision" fights). Even though he never earned a championship, Stribling remains to this day a shining example of not only skill and tenacity, but also sportsmanship, honor, and self-respect. A handful of vintage black-and-white photographs illustrate his inspirational true-life story, highly recommended especially for sports biography collections. I remember a story my grandmother told me about an invitation the Stribling family received from Al Capone in Miami just days before the Sharkey fight. They accepted and were taken to Star Island, owned by Capone. Capone and everyone there was very gracious, including his machine gun-holding thugs. Capone guaranteed he’d make Strib the heavyweight champion if Pa would let him manage his career. On the way out, Capone took my grandmother aside and threatened her, Strib and the children if they didn’t join him. She never told Strib about the threat and Pa’s answer was no. Stribling’s story involves a magnificent boxing career, almost a win against then-champ Max Schmeling in 1931 in Cleveland, then a tragic death two years later. With the Schmeling-Louis rivalry that followed, and WWII, it is understandable that Young Strib’s story was lost. Now it is found. W. L. “Young” Stribling was undoubtedly one of the best fighters to enter a boxing ring. He is often overlooked, but in The Greatest Champion That Never Was, Jaclyn White gives the Georgia boxer his due. Stribling’s extraordinary athletic accomplishments are masterfully set against the backdrop of a nation still coming of age. From the Depression era small towns of the rural South to the glamour of Miami and New York, Stribling’s intriguing story is brought to life in vivid color and sharp detail. Maybe Jack Dempsey was right when he said that Young Stribling didn’t have a “killer’s instinct.” But after reading Jaclyn Weldon White’s fascinating book The Greatest Champion that Never Was: The Life of W. L. “Young” Stribling, I think she uncovered the secret between the lines. He was overscheduled. No big-time heavyweight or light-heavyweight has ever approached 290 fights in 12 years, or 223 wins, or only 12 losses, or 51 “no decisions.” That settled, this is a superbly told story, and I’ll confess the author had me tearing up in the late chapters.